On Sunday 27th Feb 2010 I’ll be running a children’s workshop for the Design Indaba Expo. 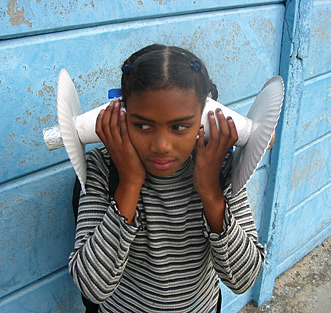 We’ll be making Kone Phones (Konis Phonis Exploratika) to explore the sounds of Planet Your Neighbourhood! “The Kone Phone (exploration model) otherwise known as ‘Konis Phonis Exploratika’ is a simple and fun ear phone designed to enhance the sounds of your world. Made from mostly paper based materials, each Kone Phone will be tweaked and decorated to suit the exacting exploration requirements of intrepid Sound Explorers”. I spent the past few weeks creating the sound design for Peter Van Heerden and Anne Historical’s (aka Bettina Malcomess) performance, Monument. Sponsored by GIPCA, its single performance took place last Friday evening – a dramatically (but fortunately not too) windy and balmy evening outside a major landmark, the Castle of Good Hope – the oldest permanent built structure in South Africa. I have a very nice mandolin made from very nice materials and made by a very nice mandolin builder. What more could I want? Well recently I came across the quirky instruments made by Stewart Port. Many people make instruments out of odd objects (don’t ask), but few match the elegance of these instruments. I particularly like his Crutch Banjo, and his Water Jug Kora. I love the thought of this guitar builder contemplating mundane objects and imagining new possibilities. I also love the fact that he treats these as serious contenders and not as jokey objects (read what he says) . And I especially like the relationship to traditional African instruments (and other ‘ethnic’ instruments i.e. instruments not to be found in music chain stores) which are often made of things that happen to be around.